Can you tell me if there is any study centre of Sikkim Manipal University, Directorate of Distance Education (SMUDDE) located in Amritsar? Sikkim Manipal University, Gangtok is incorporated under the State Legislative Act (Act IX of 1995) of the Government of Sikkim. It is recognised by UGC under section 2(f) of UGC Act, 1956. Sikkim Manipal University, Directorate of Distance Education (SMUDDE) provides with flexible learning, state of the art technology and distinguished faculty. It offers MBA, BBA, B.Sc. IT, M.Sc. IT, MCA, BCA courses. 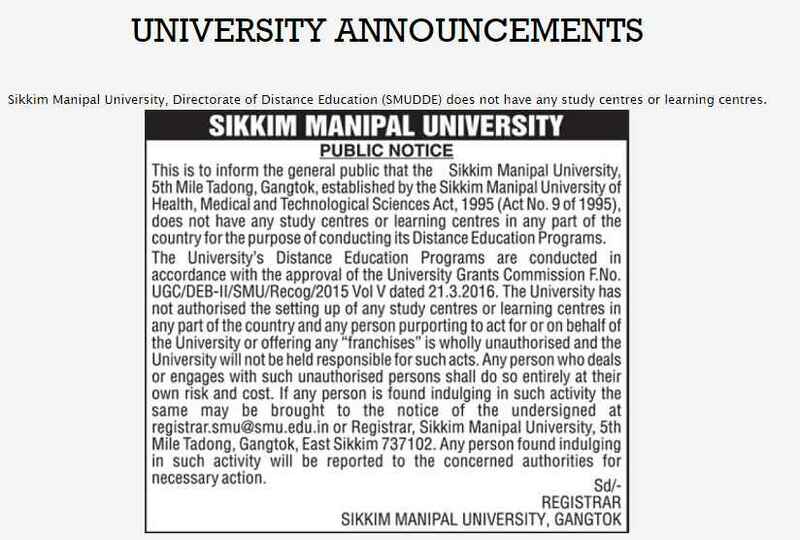 Sikkim Manipal University, Directorate of Distance Education (SMUDDE) does not have any study centres or learning centres anywhere in India.